This is it. This book is the biggest single reason I started collecting Gnome Press. I had not long started to collect 1st edition SF, one of my first being Iceworld by Hal Clement. 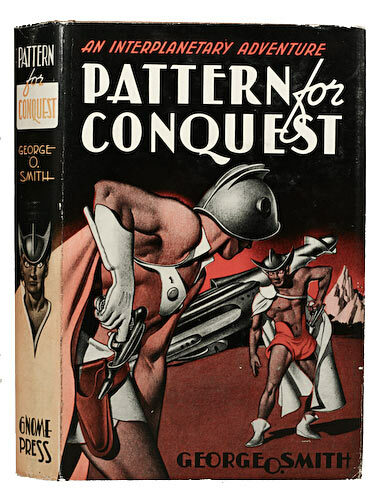 I had never heard of GP before acquiring that particular book, so I ran a search on eBay for ‘Gnome Press’ and this book – Pattern for Conquest – was the first result I got back. I remember being captured by the cover art, somehow being enthralled by it’s age… it had a special something that made me burn for Gnome Press. I’m waxing a bit lyrical here, suffice to say that it all really began here, and now I finally have a copy of the book that got the Gnome Press ball rolling. It’s the best condition copy I have ever seen, but it does have one solitary significant flaw. Lets have a look. Beautiful. 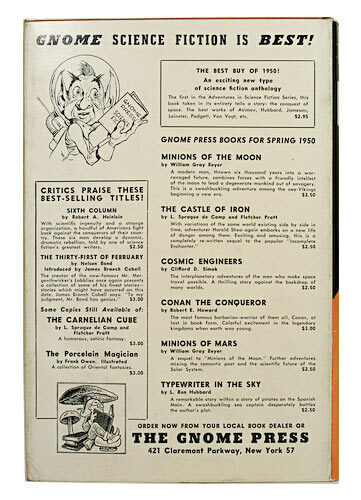 I just love the art that came out of Gnome Press once they got away from their few fantasy titles and before the obvious decline of the mid-late ’50s. 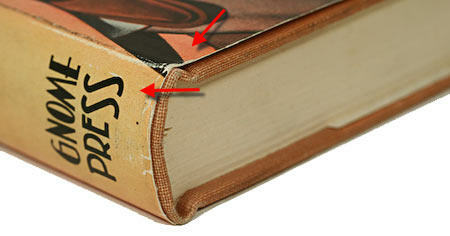 A little shelf wear to the upper right part of the cover and just the odd nick and wear around the edges. 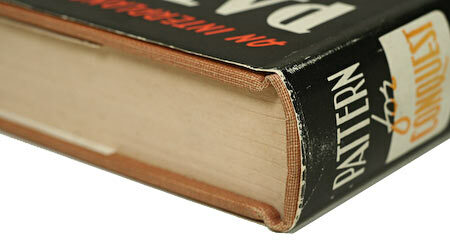 The flaw is quite evident here – sunning on the spine. It was mentioned in the description, though it’s still a little more severe than I expected. Boards are nice. A bit of bumping on the corners, but not really an issue. There is one other thing to point out, it’s a bit hard to make out and it’s more pronounced on the back, but there is a couple of centimeters of lightening down the front edge of the boards. Looks like it may have seen a bit of sun sans jacket at some point. The views from the top and bottom reveal no surprises. The jacket edges are nice. Some slight age-toning of the block, but quite negligible. You can see what looks like a water stain on the bottom of the block – it’s not. It’s actually a light scratch. You can see the jacket is very nice here, not much rubbing and practically no chipping. The head and tail of the spine are very sound also. The sunning however, is very noticeable in this view. I’ve highlighted the two tones of orange. 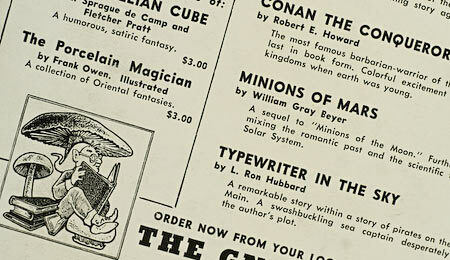 A couple of interesting items of trivia regarding this dust jacket. 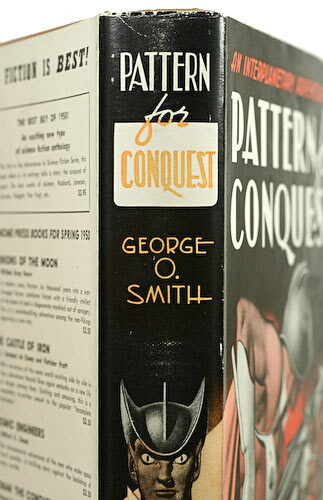 Briefly, a correction had to be made to the title on the spine (hence the odd white square) and ‘Minions of Mars’ (a never-published book) is listed on the back. Check out the Trivia Page for more detail regarding these. The rear of the jacket is beautiful and clean, rounding out a book in excellent condition. Art: Edd Cartier is credited on the jacket flap and in Eshbach, though I have seen Hannes Bok mentioned as the artist variously around the Internet. I don’t know why that might be. Quantity: 5000 copies. 3000 in hardcover, 2000 paperback armed forces issues. Binding: Orange cloth with darker spine and front board lettering. 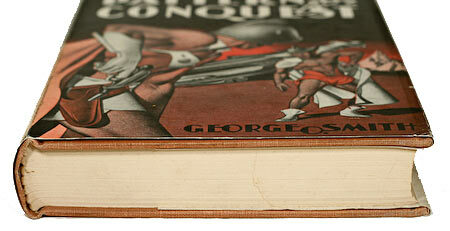 Comments: Like ‘Cosmic Engineers’, I paid a reasonable price for a copy in this condition. 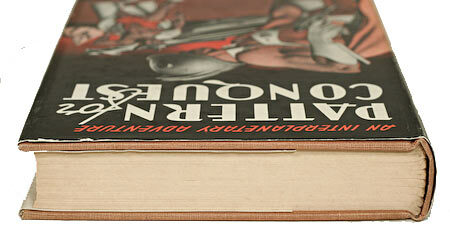 A bit unfortunate though with the sunning on the spine downgrading this to Near Fine. Still, I’m very pleased with it. A desire fulfilled. 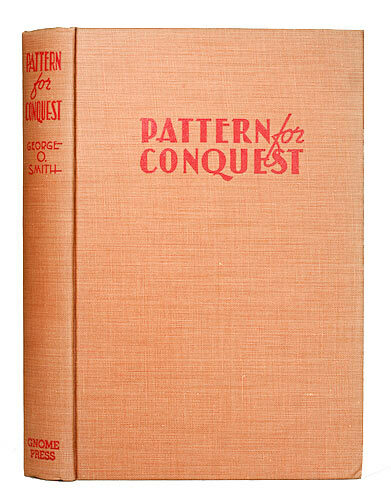 This entry was posted on July 24, 2009 at 12:39 am and is filed under 1949, Close Up with tags Edd Cartier, George O. Smith, Pattern for Conquest. You can follow any responses to this entry through the RSS 2.0 feed. You can leave a response, or trackback from your own site.